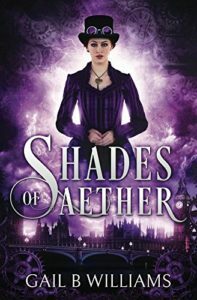 Shades of Aether, starring Amethyst Forester – your new steampunk heroine. If you’ve been looking for your new steampunk heroine, you can stop looking – Shades of Aether, by Jefferson Franklin Senior Editor Gail B Williams, brings you Amethyst Forester. Amethyst can tell you the ins and outs of an aetheric power source, but when her friend and mentor Professor Richards is murdered, leaving her set up for life and with half his house, she faces a whole new challenge – how to navigate in nineteenth century Society, with its presumptuous men and its passive aggressive women. In a world of airships, artwork, a fierce battle between the rival energy-lobbies of aetheric and electrical power, international espionage and domestic murder, Amethyst must try to find a way to be both a woman, an engineer, and increasingly a lady, while trying to make sense of her best friend’s murder. Amethyst’s world is suddenly full of new friends, like queen of Society Lady Garrington-Smythe, and her daughter Bobbie, who scandalises Society by dressing and living like a man. Most of all though it’s Benjamin Maker, Lord Fotheringham, who complicates Amethyst’s new life, not least because the Professor left him the other half of his house, and neither Society, Amethyst’s father, nor Maker’s wife will not approve. Despite coming from different backgrounds, Amethyst Forester and Benjamin Maker are a great team, unravelling the secrets of Professor Richards’ fantastic inventions, battling burglars on a nightly basis, and uncovering the mystery of the ugliest brooch on earth. But can Forester and Maker find out who killed their friend and why? Can they discover why Members of Parliament are changing their minds about aetheric power, seemingly overnight? Can they work out the connections in time to save the House of Lords and prevent a major international incident? And most of all, can they fight Society’s assumptions and the power of their own forbidden attraction? Shades of Aether is available as an e-book and a paperback now at Amazon.co.uk and Amazon.com. Get your copy today, and say hello to your new steampunk heroine. Doff your hat to Amethyst Forester.